Adventure Travel / Brazil – After Ur (3 Ga) and Arctica (2,5 Ga), other archean microcontinents merged during the Paleoproterozoic Transamazonian orogenic cycle, forming Atlantica (2 Ga).  Later, Atlantica merged with Rodinia and Gondwana / Pangea. Nowadays, the fragments of this ancient continent can be found in form of large cratonic masses in South America (Rio da Plata, São Francisco, Amazon) and Africa – Brazil Tours / Geology.